Holding our training in Costa Rica at this beautiful location offers you a fully immersive, healing experience. The training not only provides all the information and training to become an Aerial Yoga teacher, but also gives you the opportunity to delve deep into your own practice and inward journey, providing space and support for you to take a break from your daily lives to fully immerse in natures profound beauty and natural healing qualities. This will be an experience like no other! The mission of this Aerial Yoga Training is to provide each student with the foundation to teach skillfully with compassion, safety, and integrity while honoring his or her individual voice and style. The curriculum will guide you to integrate the hammock as a prop into your existing yoga or fitness teaching and personal practice. You will discover a new relationship with gravity, deepen your understanding of alignment, and enhance Pranic flow throughout the body. Trilogy’s aim is to fully integrate mind, body and spirit so our training will thoughtfully touch on how to guide your students towards a more mindful practice. Not only using aerial yoga for the many amazing physical benefits, but also using it as a tool for emotional growth and to deepen one’s connection to their own practice and life’s journey. After graduating from our Aerial Yoga Training, you will have the skill and confidence to immediately teach your own well-sequenced, stimulating and creative Aerial Yoga classes. You’ll also belong to an authentic, conscious and vibrant community of fun, and sincere aerial yoga instructors from Trilogy Sanctuary Training. 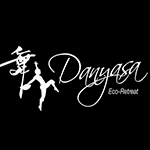 Danyasa Yoga Retreat & Eco Lodge offers world class movement arts experiences in a world class setting. Nestled in the verdant and resplendent natural beauty of Costa Rica’s Southern Pacific Coast, we are your home for retreats, classes and teacher trainings in yoga and other movement arts, as well as a hub for surfing, adventure, exploration and relaxation. Imagine yourself sitting beneath a majestic waterfall, zip-lining through the rainforest canopy, diving under the warm waves and practicing yoga in our beautiful Bamboo Yoga Play studio. Up-cycled shipping container rooms provide a perfect blend of luxurious comfort and eco-friendly sustainability. The facility offers an intimate eco-lodge experience constructed from beautifully refurbished (upcycled) cargo containers. All our rooms have real mattresses, top quality sheets and bedding, air conditioning, WiFi, in-room safes and free filtered water! ~ Breakfast and lunch with vegan and vegetarian options. ~ Aerial asana manual with 70+ poses, a comprehensive resource of poses adapted from classical yoga and modern aerial acrobatics. ~ Handouts for self-reflection, note taking and personal development. ~ Relaxing time time in paradise! Danyasa has its own private swimming pool and is located 3 minutes walk from the beach! ~ One meal per day (usually $10-13)…giving you the opportunity to explore the many delicious places to eat nearby. Leila Dora founder of Trilogy Sanctuary along with Hannahsita Smyth and Brittany Johnson, both teachers at Trilogy – have created a complete Aerial Yoga curriculum, drawing on valuable knowledge they have discovered from many years of practicing and teaching. In addition to creativity from years of being aerial acrobatic performers. They have a combined experience of 20 years in the field of yoga, fitness and aerial arts. Their individual styles of teaching will inspire you to find your own creative and individual teaching style.Trilogy’s Aerial Yoga Training offers an incredibly comprehensive aerial yoga teacher training program. Topics Include: Warming up and cooling down with the silk, standing postures (on the floor and in the silk), suspended inversions and flying poses, hand stands, back bends, forward bends, hip-openers, seated postures, restorative poses and flips and tricks. Healing Aerial Yoga – a more gentle and restorative approach. Aerial Yoga level 1 – a well rounded class for beginner and intermediate students. Aerial Yoga Fitness – a class with a focus on strength building in order to progress to higher level classes. Inversions – Inversions – Inversions! The spiritual and emotional benefits of practice and poses. WHY TRILOGY? WHAT TYPE OF CERTIFICATION IS IT? Trilogy Sanctuary is a yoga alliance certified studio. Yoga alliance certifies our 200 hour yoga program. Aerial yoga is currently an unregulated form of yoga and yoga alliance does not offer certification for aerial trainings. If the aerial training is part of a 300 hour extended yoga training then that is how it can be certified, it counts as a part of the complete 500 hour training. For a stand alone Aerial certification there are actually no governing bodies that give credentials of any kind to these types of trainings. When choosing a training, it is important to find a studio or program that is well known and has a high standard of teaching. There are many franchised programs that are very restrictive – taking a training with them means you can only teach at their franchised studios. Trilogy’s aerial certification is very well rounded and has no restrictions on what or where you can teach. It will give you the tools to teach a Level 1 aerial yoga class anywhere in the world. Trilogy Sanctuary is one of the leading Aerial Yoga studios in California so it is a highly recognized certification with very high standards. We only accept students who we feel will become competent teachers, which is one reason why we only accept those with a 200 hour yoga, pilates or PT certificate. We also require previous aerial yoga experience. Lastly, our training is one of the few trainings that gives you experience in teaching real students, in our community classes. This is an invaluable part of the training process and is essential to creating a good teacher. If you do decide to choose us to certify you, we offer support from start to finish, to ensure that all of our students feel confident in teaching a safe class to all students. Applicants must have a 200 hour yoga instructor certification (RYT), Personal Training certification (CPT), Massage Therapist certification (RMT), or Physical Therapist certification (PT). ***We do make exceptions for those who have other types of teaching, or therapist qualifications or experience, please contact us to discuss! Must have completed a minimum of 10 aerial yoga classes prior to the teacher training program start date. To reserve your spot, a $500 non-refundable deposit is required. If this is paid by December 31s you will receive the early bird discount of $2150. PLEASE NOTE: There is no official certification governing body like Yoga Alliance for aerial certification. Trilogy Sanctuary is one of the leading Aerial Yoga studios in North America so it is a highly recognized certification with very high standards. The training will give you the tools to teach a Level 1 aerial yoga class anywhere in the world!